Meet the Toyota Sedan & Hatchback Family! For Mt. Holly drivers looking for a vehicle that is efficient, reliable, and well-equipped, the new Toyota lineup has a wide range of options to choose from. Whether you’re looking for the assurance and added visibility of the Toyota Safety Sense™ driver assist suite or the versatile and intuitive capabilities of an Entune™ infotainment system, these new Toyota sedans and hatchbacks check all the boxes. 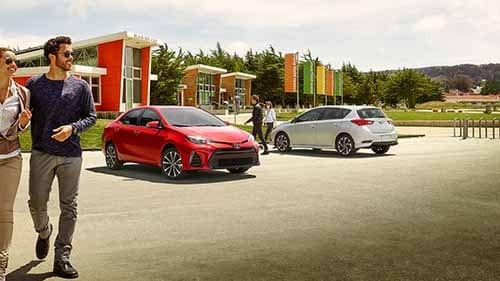 See which model best meets your personal driving needs by learning more about the exciting Toyota sedan and hatchback models available at Toyota of Gastonia. With an affordable price tag and an EPA-estimated 40 mpg highway, the Yaris iA is a subcompact sedan that’s tough to overlook for Shelby drivers on a budget. Still, this model also comes quite well equipped. Available in just one trim level, the Yaris iA features a forward collision warning system, seven-inch touchscreen, Bluetooth® phone and audio, and much more! 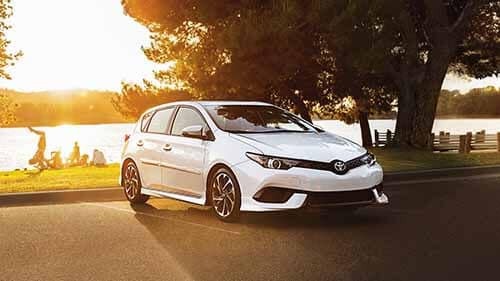 The best-selling car in the world, the Toyota Corolla is an affordable, reliable, and incredibly well-rounded compact sedan that also lets you save money at the pump by getting up to an EPA-estimated 40 mpg highway. Despite its low price tag, the Corolla comes standard with the Toyota Safety Sense™ P (TSS-P) driver assist package, as well as Bluetooth® phone and audio. You can also move up the ladder for access to Entune™ Audio Plus with the Connected Navigation App. The new Toyota Camry has been fully redesigned! This popular midsize sedan is now more aggressively styled than ever, and it follows through on substance with a standard 2.5L Dynamic Force four-cylinder engine that makes 203 hp and a robust available 3.5L V6 that generates 301 hp. 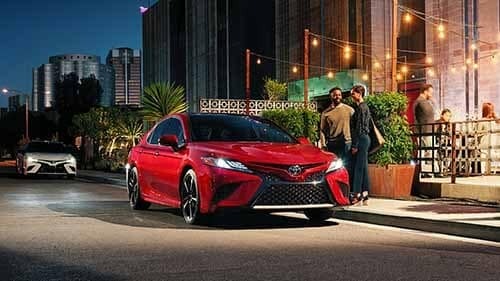 A new double-wishbone multi-link rear suspension, new eight-speed automatic transmission, and revised steering work all help bring more dynamic handling to this year’s Camry. 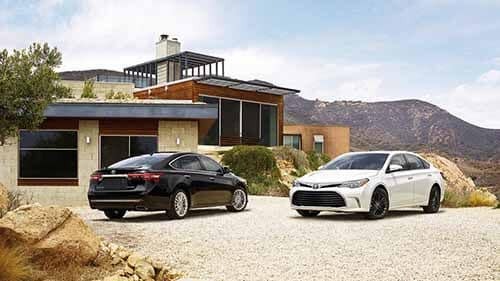 The most luxurious model in the lineup, the Toyota Avalon is a premium full-size sedan with a cavernous interior and an abundance of premium features. Every model comes with leather upholstery and French stitching, multi-stage heated front seats, and a spacious second row that can comfortably seat either two or three adults. You’ll also enjoy premium ambient lighting and meticulously crafted soft-touch materials and trim accents from front to back. 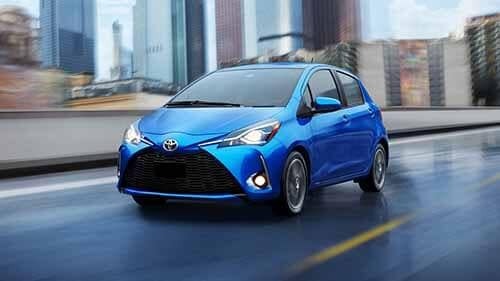 Available in both two-door and four-door configurations, the Toyota Yaris is a practical everyday driver that works great for college students, daily commuters, and small families alike. 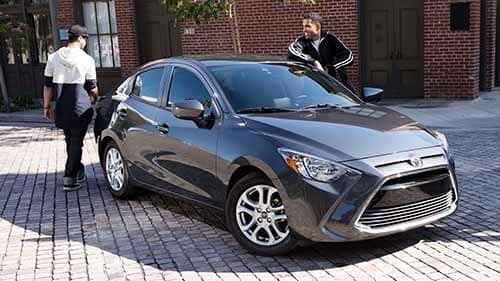 One of the more affordable cars on the market, this hatchback still gets a generous array of standard fare, from Toyota Safety Sense™ to Bluetooth® hands-free calling and audio streaming. And when you need extra space for storage, all you have to do is fold down this hatch’s rear seats to open up even more room! Formerly a Scion model, the Corolla iM now proudly bears the Toyota nameplate. Offered in a single trim level, this compact hatchback comes abundantly equipped for the price, with creature comforts that include dual-zone automatic climate control, a leather-wrapped steering wheel, and heated exterior mirrors. You’ll also be able to take advantage of standard tech like a rearview camera, a seven-inch touchscreen interface, Bluetooth®, and a full suite of driver assist safety features. Whether you’re looking for the versatility of a hatchback, the affordability of a small car, or the opulence of a full-size sedan, you’ll find reliability, sophisticated features, and capable performance across the board here at Toyota of Gastonia. Make sure to explore our current new vehicle specials for some great deals on new Toyota sedans and hatchbacks, and then apply for financing to get a headstart on securing a payment plan that fits your budget. Stop in for a test drive any day of the week at 4821 Wilkinson Blvd in Gastonia, NC; we’re located right across the street from MS PowerSports and just six miles southwest of Mt. Holly. If you have questions or wish to schedule your test drive, don’t hesitate to contact us!